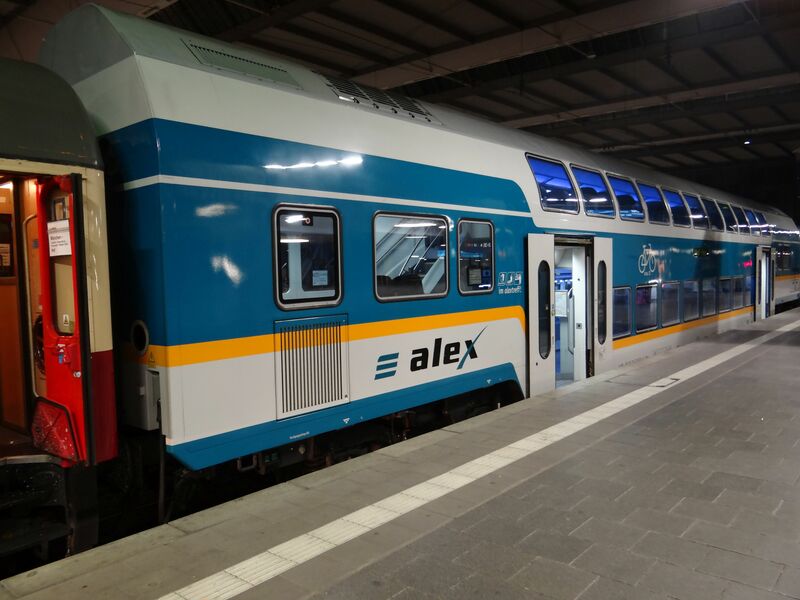 When the story of ALEX began, it was Arriva-Länderbahn-Express, a private rail company operating from München up to the Bavarian hills and mountains. One of the owners was the Swiss state SBB and the coaches used at the time were old SBB wagons. This picture is from those times. 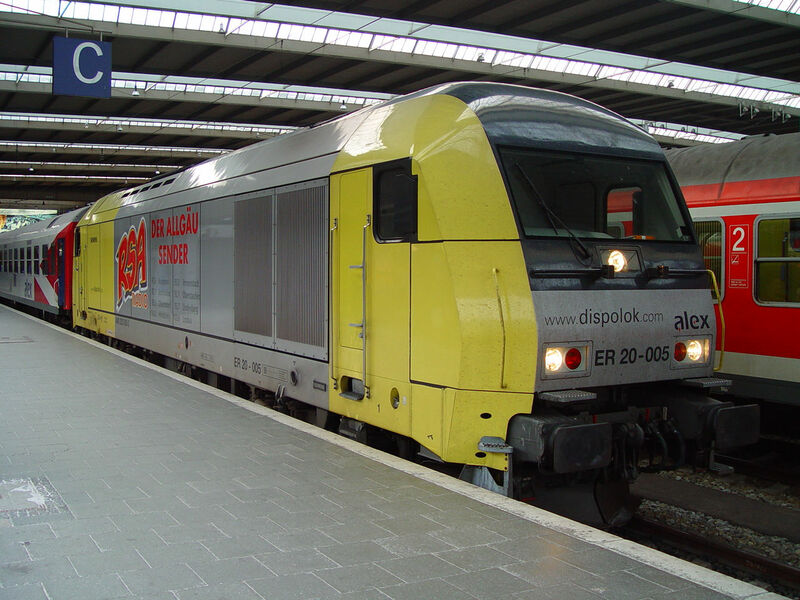 This is a Siemens ER 20 Hercules leased from what then was Siemens Dispolok, heading a rake of ex Swiss SBB coaches painted in ALEX colours. The key line was the München-Immenstadt-Lindau-line. Picture from München Hauptbahnhof 7.7.2005 by Ilkka Siissalo. Same train as above, but here showing the colouring of the old ex-SBB coaches. Picture from München Hauptbahnhof 7.7.2005 by Ilkka Siissalo. The current alex is not the same company as the first ALEX was. The first company, whose trains are shown in the pictures above, was partly owned by the Swiss federal railways SBB. The current one however is a daughter's daughter company of the Italian FS Trenitalia. 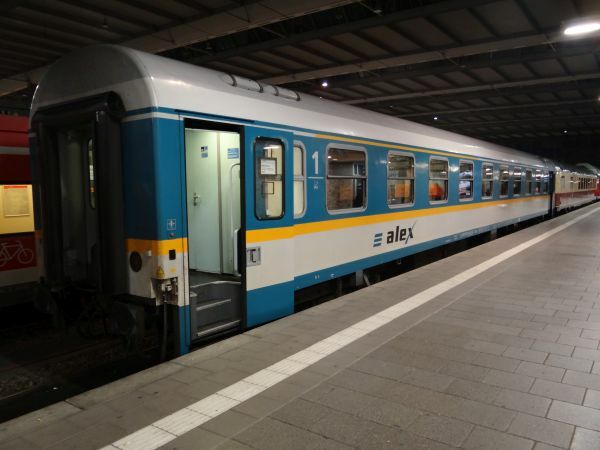 Currently the tradename alex (with small letters) stands currently for Allgäu-Express. Formerly ALEX meant Arriva-Länderbahn-Express. This is the new alex. This locomotive is a third generation Siemens Taurus of Br183. alex serves today the lines Hof–München and München–Lindau/Oberstdorf as well as München-Schwandorf-Praha (Prag, CZ). 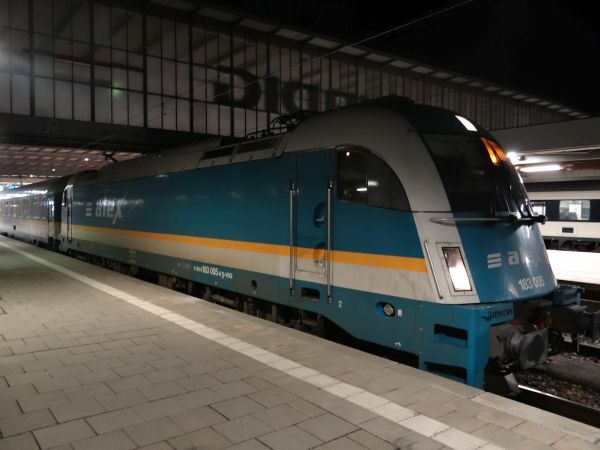 Officially this is a service of the rail operator BEG, Bayerische Eisenbahngesellschaft, which in turn is a part of the company Länderbahn, which in turn belongs to the Netinera group and Netinera is owned by the Italian state railways. The personnel working in these alex trains work for Vogtlandbahn, which also is a daughter company belonging to Länderbahn, so this is all pretty complicated. alex uses Taurus locomotives of Br183 in the electrified traffic routes and Siemens EuroRunner ER20 (hercules) diesel locomotives for the non-electrified routes of Oberstdorf/Lindau–Immenstadt–Kempten–München and Regensburg–Schwandorf–Hof and Regensburg–Schwandorf–Furth im Wald. The ER20 diesels are rented from Alpha trains (Former Angel trains). The Taurus locomotives are leased from Hannover Mobilien Leasing. 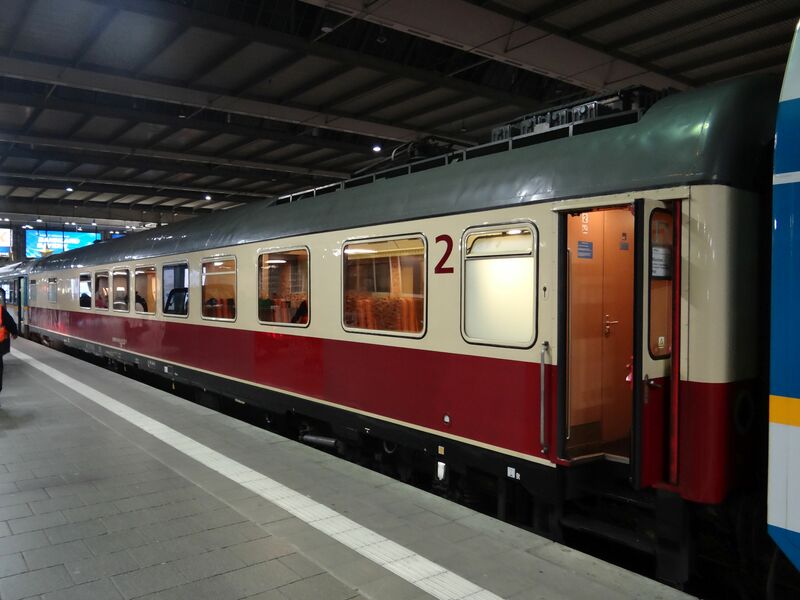 The coaches used are primarily old German, Swiss and Italian express train coaches, at least partly renovated. 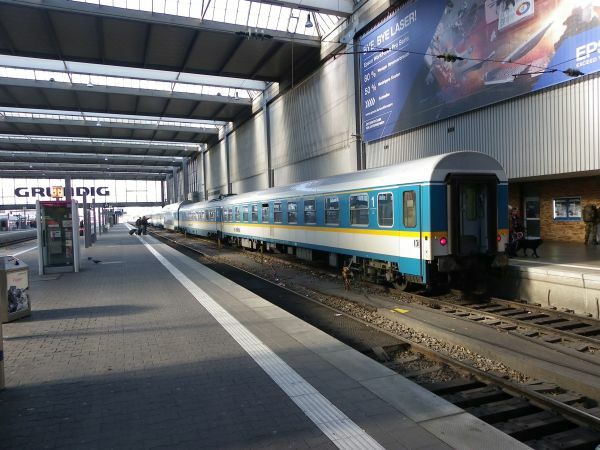 Picture of the alex Siemens Taurus Br183 in München 27.12.2015 by Ilkka Siissalo. Another one of the Siemens Br183 Taurus 3 locomotives ready to start pulling an alex train towards Schwandorf. Picture of the alex Siemens Taurus Br183.03 in München 16.11.2012 by Ilkka Siissalo. 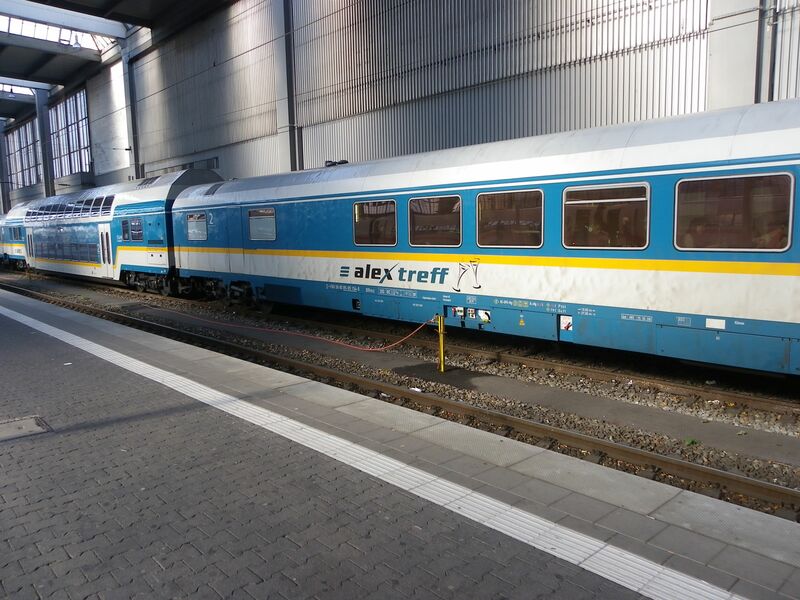 The present day alex has 11 restaurant/club coaches which they call "Alex treff". Two of them are old Trans Europ Express coaches which are still kept in their traditional TEE paintings. This is one of those two. Picture from München Hauptbahnhof 27.12.2015 by Ilkka Siissalo. 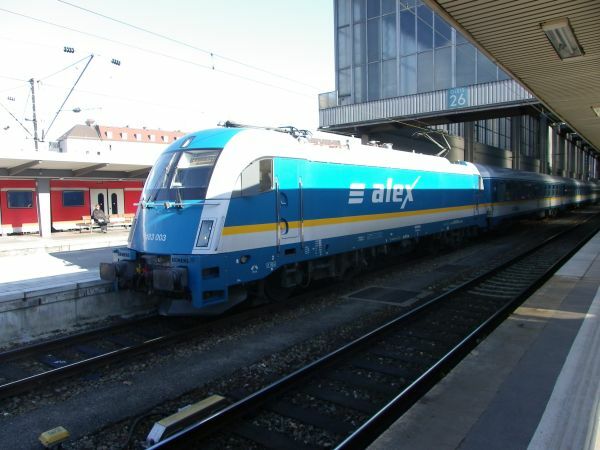 Most of the alex treff coaches are painted in alex blue colours like this one. Only two are in their original TEE colours. But they all are former DB restaurant coaches. Picture from München Hauptbahnhof 16.11.2012 by Ilkka Siissalo. A typical alex train is a mix of old express train coaches and modern doubledecker coaches. These doubledeckers are made by Bombardier. alex has seven of them. One of the more modern alex coaches, a typical old express train coach. alex has 80 coaches, out of which only 9 are new. 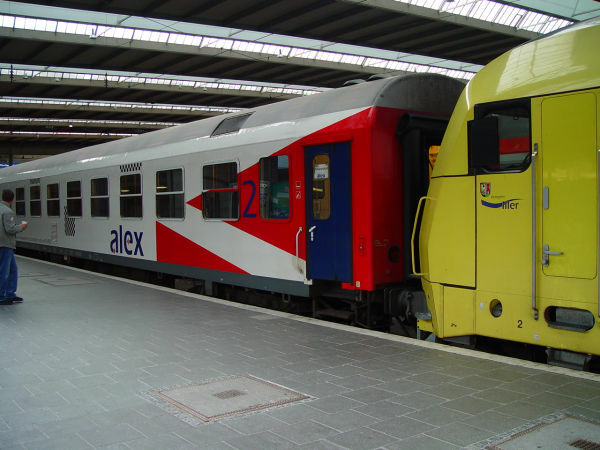 A very typical alex train, with just one new doubledecker coach and five former express train coaches from either Germany, Switzerland or Italy.